Numerous individuals provided these Allen County, Indiana abstracts of title to The Genealogy Center for the purpose of preserving and presenting this valuable historical data. 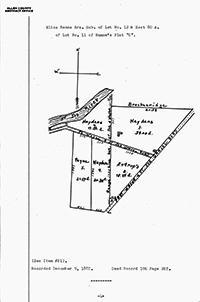 The Genealogy Center welcomes the opportunity to scan and make available these and other historical property documents. Contact The Center at Genealogy@ACPL.Info to get more information or arrange for your property documents to be scanned. Edsall's Addition, Lot 12 (West 1/2) - cont.